Density bonuses provide unintended consequences. The City of Vancouver continues its relentless crisis capitalism to address the ongoing housing affordability problems that are, in part, its own creation. The recent city proposals are to use a density bonus scheme to create more “affordable” rental housing supply. 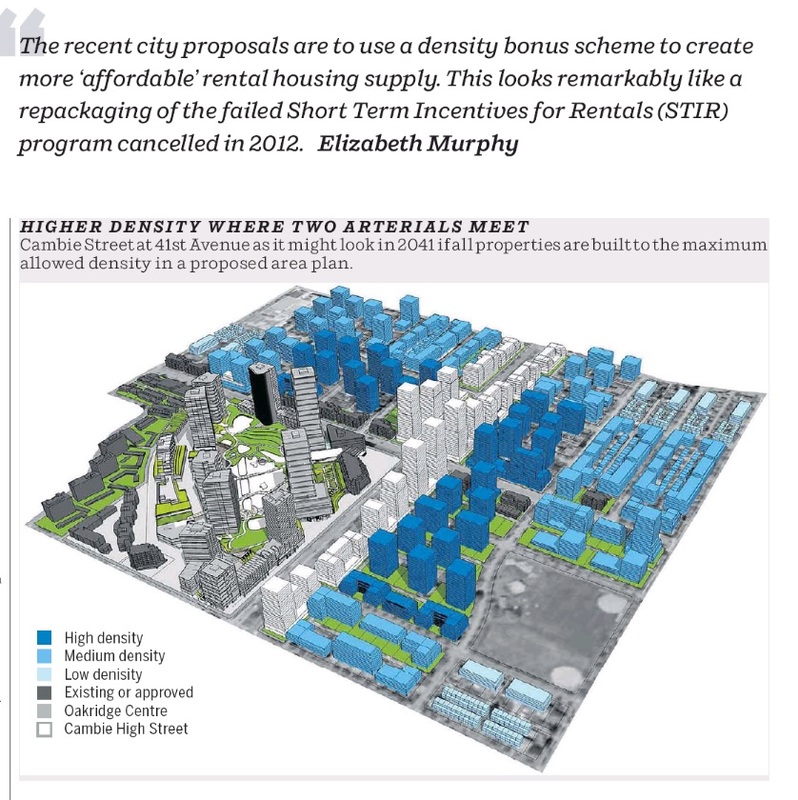 This looks remarkably like a repackaging of the failed Short Term Incentives for Rentals (STIR) program cancelled in 2012 and the subsequent Rental 100 program, but now with more density bonuses. At least the city is now acknowledging that supply alone is not the answer. 2016 was a record year for new unit starts, about double the 10-year average. Yet affordability continues to worsen as most of the supply is expensive and disconnected from local incomes. The city’s proposals attempt to address this, but through potentially problematic means. At a news conference on July 23, the city outlined the incentive options for developers, including extra density, parking relaxations and development cost levy (DCL) waivers. The Oakridge Municipal Town Centre pilot program will include a variety of housing around the Oakridge Centre mall. Midand highrise housing in the area would have to be either 100 per cent rental, with 20 per cent of those units meeting below-market affordability targets, or a blend of 30 per cent social housing units and 70 per cent strata or condo units. Following the Oakridge Town Centre pilot, the options would be considered for expansion across the city. The affordability targets are based on no more than 30 per cent of household income spent on housing for incomes of $30,000 to $80,000 per year. This is essentially the same affordability targets the city used under their controversial 2009 rental program STIR. Former director of planning Brent Toderian outlined three main problems with STIR: It did not create much rental; huge height and density increases were necessary to secure very few rental units or amenity contributions; and STIR unit rents were high. The city found that mixed condo/rental STIR projects were the most problematic since they were generally larger in scale and inflated land values, but any community amenity charges (CACs) earned went back into the project to cover the rental. The subsidies were an average of $70,000 per unit, whereas the 100 per cent rental STIR projects were only $5,000 per unit. Loss of CACs for rental subsidies will need to be covered by the capital plan. STIR was replaced in 2012 with the Rental 100 program. All projects are now 100 per cent rental, again aimed at the same income levels of about $30,000 to $80,000. It also limits where the projects can be located (on arterials and close to shopping areas) and to a maximum six storeys so they are wood frame with lower construction costs. However, these units are mostly small in size, still have high rents, and have not provided affordability. The program also targets many locations that have existing older, more affordable rentals, and the demolitions result in a net loss of affordability. The projects are generally out of scale with the surrounding area. The new program would require more height and density bonuses to achieve the secured lower rents. This will reintroduce many of the problems the original STIR program was cancelled for, especially for mixed social housing/condo projects. Size matters for a number of reasons, not only because the buildings will not provide a proper fit for the neighbourhood. The increased height and density inflates the land values around the site as it sets precedents that increase development pressures on older, more affordable surrounding housing stock. For the city to warn developers not to pay too much for land won’t work, as we have seen in the Cambie corridor. Assemblies and speculation have continued since the Canada Line was built, in spite of city warnings about development fees that would take back most of the land lift. The market just prices in the inflation. The Cambie corridor is already overstressing infrastructure and much of what has been planned is yet to be built out, such as the Oakridge mall towers and the RCMP site. The Canada Line is at peak hour capacity and expansion is difficult and costly with no funding allocated. In some instances, it is questionable if expansion of some of the stations are technically possible. Any DCLs or CACs generated will go toward the rental subsidies, so amenities such as parks, recreation, daycare, schools and public art will need to be fully funded by capital planning. Generally, amenities are not being adequately implemented in areas that are up-zoned and waiving development fees will only add to that problem. The city has already admitted there is enough existing zoned capacity to exceed future growth to 2041. 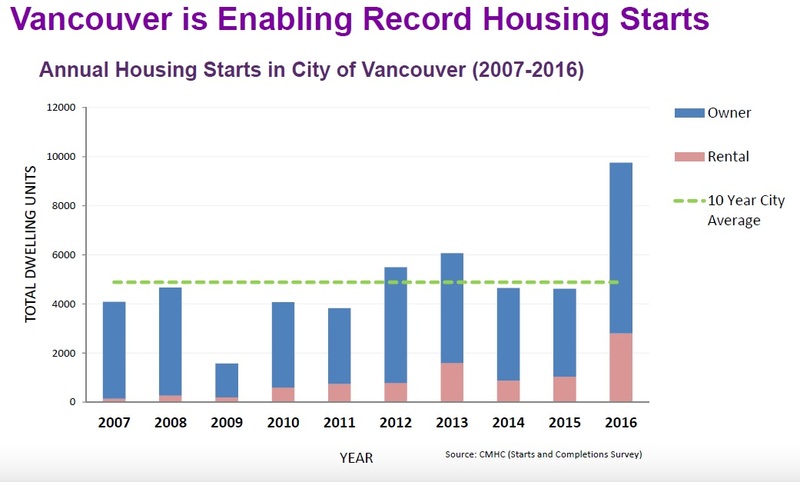 Vancouver is approving new unit starts at a record pace. In fact, massive rezoning has contributed to land cost inflation. Adding more programs that increase development pressures may exacerbate land inflation. The lesson from STIR was that smaller 100-per-cent rental projects yielded more rentals with fewer subsidies and fewer negative impacts on the surrounding areas. Adding more density bonuses to get a few below-market rents may just be counterproductive. The city alone cannot provide affordable housing. Rental subsidies are best done through provincial and federal programs. The city’s tools are limited and density bonusing has other unintended consequences that can make the problem worse. There are many ways to add more rentals. The city should be prioritizing options that individuals can do such as conversions for more secondary suites as an incentive for character house retention that could provide thousands of units across the city. Huge density bonuses that provide relatively few new rentals have unintended consequences. The lessons from STIR should be learned from and not repeated. Note: Online link to the Sun article not available at the time of posting, but was added to the Sun online at 1:30 pm Aug. 5, 2017. This entry was posted in Elizabeth Murphy, Vancouver Sun and tagged Affordable Housing, Community Plans, Elizabeth Murphy, STIR, Vancouver. Bookmark the permalink.